I’m including this short film from Georges Méliès in my “history of horror” this year, although it is mostly a typical “trick film” with a light-hearted, non-frightening tone, because it does include a somewhat unusual treatment of a head. Whether intended as horror or not, I’m tempted to see it as a kind of predecessor to “Re-Animator” and other movies with animated heads. We see a typical Méliès proscenium-style set, this time dressed to suggest a medieval castle. There is a sword on the wall, as well as an owl. 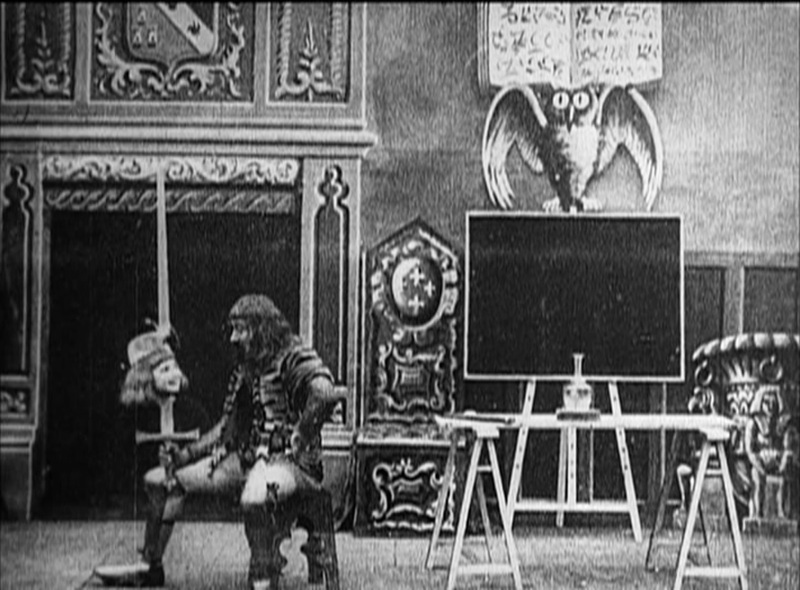 In front of the wall is an easel with a chalkboard on it, and Méliès himself appears in a wig and a costume suggesting an off-duty knight. He draws a woman’s head on the board, then reaches out and pulls it off the board. When he places it on a bottle on the table, it comes to life and begins speaking or perhaps singing. Méliès crawls under the table, to demonstrate to the audience that there is nothing underneath the head. He impales it on the sword(!) and it continues speaking with no apparent discomfort. He then puts it on a tripod and wraps a blanket around the legs of the tripod. When he removes the blanket, the whole woman has appeared. She takes his hand and bows to the audience. He then waves a fan at her and she slowly fades out. He makes her appear once again on the table, then removes her head and throws it back onto the chalkboard, where it becomes a drawing again. Again, this movie isn’t intended to be all that frightening, but the bit about impaling a talking head on a sword struck me as rather creepy nonetheless. The movies of Méliès often draw upon popular conceptions of magic, which have certain occult overtones, however innocent and playful they may be. I was impressed by the effects in this film, which we have to remember are all done in-camera, and particularly the fade out of a single person while the rest of the image remained steady struck me as impressive for the time. Méliès had done many trick films with people and objects appearing and disappearing at this point, of course, but the interactions between himself and the head are more effective here than many of the effects he did up to this point. There are no noticeable jump cuts, although when Méliès holds the head it quite obviously turns into a mannequin’s head, and he holds it so that the face does not look at the camera to make this less obvious.